Traduite en français pour la première fois et accompagnée d'une paraphrase et de notes perpétuelles, par Barthélémy Saint-Hilaire, membre de L'Institut (Académie des Sciences morales et politiques). Tome I. Paris 1861. 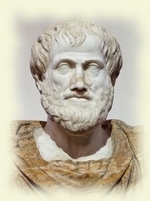 The works of Aristotle. Translated into English under the editorship of W.D. Ross (1908). Volume II (Physica / De Caelo / De Generatione et Corruptione). The Physics is translated by R. P. Hardie and R. K. Gaye. Online reading The works of Aristotle. Translated into English under the editorship of W.D. Ross (1908). Volume II (Physica / De Caelo / De Generatione et Corruptione). The Physics is translated by R. P. Hardie and R. K. Gaye. Physik. Deutsch: C.H. Weiße. Leipzig 1829.